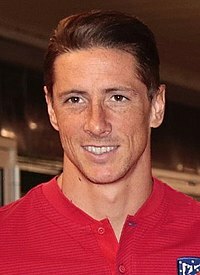 Fernando José Torres Sanz (Spanish pronunciation: [feɾˈnando ˈtores]; born 20 March 1984) is a Spanish professional footballer who plays as a striker for J1 League club Sagan Tosu and the Spain national team. Torres started his career with Atlético Madrid, progressing through their youth system to the first-team squad. He made his first-team debut in 2001 and finished his time at the club with 75 goals in 174 La Liga appearances. Prior to his La Liga debut, Torres played two seasons in the Segunda División for Atlético, making 40 appearances and scoring seven goals. Torres joined Premier League club Liverpool in 2007, after signing for a club record transfer fee. He marked his first season at Anfield by being Liverpool's first player since Robbie Fowler in the 1995–96 season to score more than 20 league goals in a season. The most prolific goalscoring spell of his career, he became the fastest player in Liverpool history to score 50 league goals. He was named in the FIFA World XI in 2008 and 2009. Torres left the club in January 2011 to join Chelsea for a British record transfer fee of £50 million, which made him the most expensive Spanish player in history. In his first full season at Chelsea, Torres won the FA Cup and the UEFA Champions League. The following season, he scored in the final of the 2012–13 UEFA Europa League, helping Chelsea to win the competition for the first time. Torres is a Spanish international and made his debut against Portugal in 2003. He has been capped over 100 times and is his country's third-highest goalscorer of all-time. With Spain, he has participated in six major tournaments: UEFA Euro 2004, the 2006 FIFA World Cup, Euro 2008, the 2010 World Cup, Euro 2012, and the 2014 World Cup. Spain won the three tournaments from 2008 to 2012, with Torres scoring in the finals of both Euro 2008 and Euro 2012. He scored the winning goal in the 2008 European Championship, and won the Golden Boot for highest goalscorer in 2012. Born in Fuenlabrada, Community of Madrid, Torres became interested in football as a child and joined his first team, Parque 84, at age five. His father, José Torres, worked during Torres' childhood, and his mother, Flori Sanz, travelled daily with him to training sessions. His grandfather was not a passionate football fan, but took pride in being an Atlético Madrid supporter, and Torres inherited his love for the club. Torres began playing football as a goalkeeper, the position his brother played in. At age seven, however, he started playing regularly as a striker in an indoor league for the neighbourhood club, Mario's Holland, using the characters from the anime Captain Tsubasa as inspiration. Three years later, aged 10, he progressed to an 11-side team, Rayo 13. He scored 55 goals in a season and was one of three Rayo 13 players to earn a trial with Atlético. He impressed the scouts and joined the club's youth system at age 11 in 1995. After progressing through the ranks, Torres won his first important youth title in 1998. Atlético sent an under-15 team to compete in the Nike Cup, in Spain and Europe, to play against youth teams from other clubs; Atlético won the tournament. He was later voted the best player in Europe for the age group. In 1999, at the age of 15, Torres signed his first professional contract with Atlético. He spent his first year playing in the youth team and participated in the Honor Division when he was 16. The 2000–01 season had started poorly, as Torres suffered from a cracked shinbone which kept him out of play until December. Torres trained with the first team to get prepared for pre-season, but eventually made his debut on 27 May 2001, at the Vicente Calderón Stadium, against Leganés. One week later, he scored his first goal for the club, against Albacete, and the season finished with Atlético narrowly missing out on promotion to La Liga. Atlético were promoted to La Liga at the end of the 2001–02 season, although Torres did not perform well in the season, as he netted only 6 times in 36 appearances in the Segunda División. Torres' first season in La Liga, 2002–03, was better, however, as he scored 13 goals in 29 appearances, with Atlético finishing in 11th place. In July 2003, soon after his takeover of the club, Chelsea owner Roman Abramovich had a £28 million bid for Torres rejected by Atlético's board of directors. In the 2003–04 season, his second in La Liga, Torres made further strides, scoring 19 league goals in 35 appearances, meaning he finished as the joint third-highest scorer in the league. At age 19, Torres was named Atlético's captain. Atlético narrowly missed out on qualification for the UEFA Cup, but by finishing in seventh place in the 2003–04 season, they qualified for the 2004 UEFA Intertoto Cup, giving Torres a first taste of a competition at the European level. He scored two goals in the two fourth round matches against OFK Beograd, with one coming in each leg. Atlético reached the final, but lost 3–1 on a penalty shoot-out to Villarreal following a 2–2 draw on aggregate. FA Premier League champions Chelsea were believed to be interested in signing Torres during the summer of 2005, but Atlético club president Enrique Cerezo said that they had "no chance" of signing him. Cerezo later said in January 2006 that the club was willing to listen to offers for Torres, and Torres claimed Newcastle United of the FA Premier League had made a bid to sign him in March. Torres stated after the 2006 FIFA World Cup that he had turned down an offer to join Chelsea at the end of the 2005–06 season. He scored 14 league goals in the 2006–07 season. The English media reported that he was the main transfer target of FA Premier League club Liverpool, but Cerezo stated, "We've received no offer from Liverpool or any other club or player." Days later, however, new reports suggested Atlético had agreed a deal with Liverpool for Torres; the fee was rumoured to be £25 million with Luis García moving to Atlético in a separate transfer deal. On 30 June, Atlético announced a deal to sign Diego Forlán from Villarreal, in what was seen as a move to replace Torres before his departure became official. On 2 July, it was reported that Torres had cut short a vacation to fly back to Madrid to finalise the move to Liverpool. The following day, Torres passed a medical at Liverpool's Melwood training ground. He held a press conference in Madrid on 4 July to bid farewell to the Atlético fans, before completing his move to Liverpool on a six-year contract. The transfer fee was the highest in Liverpool's history. In March 2008, manager Rafael Benítez stated in an interview with The Times that Torres was acquired for around £20 million, although this figure takes into account García's move to Atlético. Torres was named the Premier League Player of the Month for February 2008, during which he scored four goals in four appearances, including a hat-trick against Middlesbrough on 23 February 2008. This hat-trick and another in a 4–0 victory over West Ham United on 5 March 2008 meant he became the first Liverpool player since Jack Balmer in November 1946 to score a hat-trick in successive home matches. Later in March, after he scored a 47th-minute header against Reading at Anfield, he became the first Liverpool player since Robbie Fowler in the 1995–96 season to score 20 league goals in a season. In April, he scored another Champions League goal, this time against Arsenal in the quarter-final second leg, as Liverpool advanced to the semi-final. This goal took him onto 29 goals for the 2007–08 season in all competitions, eclipsing Michael Owen's personal record for goals in a season. On 11 April 2008, it was announced Torres had made a six-man shortlist for the PFA Players' Player of the Year award, which was eventually won by Cristiano Ronaldo of Manchester United. The Spanish international was also nominated for the PFA Young Player of the Year Award, which was won by Cesc Fàbregas of Arsenal and was named in the PFA Team of the Year. In May, he finished second to Ronaldo for the FWA Footballer of the Year award. On 4 May 2008, Torres scored a 57th-minute winner against Manchester City, which equalled the consecutive Anfield league goal record of eight games set by Roger Hunt. After scoring his 24th league goal in the final game of the season, a 2–0 win against Tottenham Hotspur, he set a new record for the most prolific foreign goal scorer in a debut season in England, eclipsing Ruud van Nistelrooy's 23 goals. He ended the season in joint second place with Emmanuel Adebayor in the race for the Premier League golden boot. Torres was subject to media speculation that Chelsea were willing to pay £50 million to sign him, but Torres responded by saying it would be "many years" before he left Liverpool. Liverpool co-owner Tom Hicks also negated the idea of a transfer, saying he would not allow Torres to leave the club at any price. Torres made a scoring start to the 2008–09 Premier League season with a 25-yard shot into the bottom right-hand corner away at Sunderland, which was the only goal in a 1–0 win on 16 August 2008. He suffered a hamstring tear in a 0–0 draw against Aston Villa, which would keep him out for two to three weeks. Torres made his return in a 2–1 victory against Marseille in the Champions League and went on to score two goals in the Merseyside derby against Everton on 27 September 2008 to give Liverpool a 2–0 win. He followed this up with another two goals the following weekend against Manchester City in a 3–2 win away at the City of Manchester Stadium as Liverpool came back from a two-goal deficit. The first of these was the thousandth Liverpool goal to be scored in the Premier League. Torres picked up a hamstring injury during a 2010 FIFA World Cup qualifier, meaning he was likely to miss three games for Liverpool. On 22 October 2008, Liverpool played Torres' former club Atlético in the Champions League at the Vicente Calderón Stadium, but his injury meant he missed out on the game. Atlético president Enrique Cerezo had given him a VIP invitation to watch the game, but he declined this to continue his rehabilitation from injury in Merseyside. He was named in the FIFPro World XI team for the 2007–08 season on 27 October 2008. Torres made his return for Liverpool on 8 November 2008 after coming on as a 72nd-minute substitute in a 3–0 victory against West Bromwich Albion. He said he would be interested in returning to former club Atlético eventually, saying, "I don't know if I will retire there, but I would like to go back and finish some things that are left to do." He was ruled out of action for two to three weeks following Liverpool's 1–0 victory over Marseille in the Champions League in November, where he picked up a hamstring strain, which was later extended to at least four weeks by specialists. He was named on the shortlist for the FIFA World Player of the Year award in December, and eventually came in third place behind Ronaldo and Lionel Messi. Torres returned to action on 3 January 2009 as a substitute with a goal in the 2–0 win over Preston North End, his first in the FA Cup. He scored two late goals for Liverpool to secure a 2–0 victory over Chelsea on 1 February 2009. Despite having spent a year and a half at the club, Torres was chosen as number 50 in The Times's list of "The 50 greatest Liverpool players", reinforcing the impact he had made at Liverpool in such a short period of time. Torres faced his old rivals Real Madrid on 10 March 2009 in the Champions League last 16 and due to an ankle injury, he had a painkilling injection before the game to enable him to play. He scored the first goal of the game, which ended as a 4–0 victory, meaning Liverpool progressed to the quarter-finals 5–0 on aggregate. Four days later, he lined up against Manchester United at Old Trafford and he scored the equaliser in a game that finished as a 4–1 victory. His goal celebration at Old Trafford endeared him to Liverpool fans when he held out his hand to United fans – making the “five times” gesture – signifying Liverpool’s five Champions League titles (to United’s three). He was named in the PFA Team of the Year for the second season running in April 2009. Torres scored his 50th goal for Liverpool on 24 May 2009 against Tottenham on the final day of the 2008–09 season, his 84th appearance. Following the end of the season, Torres agreed a new contract with Liverpool, which he signed on 14 August. By signing, Torres had the option of a one-year extension after the contract's expiration in 2013. Torres scored two goals in a 3–2 win over West Ham United on 19 September 2009, a result that took Liverpool to third in the Premier League. One week later, he scored his first hat-trick of the 2009–10 Premier League season in a 6–1 victory over Hull City at Anfield. He was named Premier League Player of the Month for September, after scoring five goals during the month and becoming the Premier League's top goalscorer. On 25 October 2009, he scored the first goal in a 2–0 victory for Liverpool over Manchester United, after which Rafael Benítez praised Torres' performance, saying, "We were waiting for that final pass. When it came we knew he would score." Torres was named in the FIFPro World XI for the second successive season in December 2009. His stoppage-time winning goal against Aston Villa on 29 December 2009 made him the fastest Liverpool player ever to score 50 league goals. He was substituted on 65 minutes in a 1–1 draw with Birmingham City on 4 April 2010, which Benítez justified by saying Torres was "exhausted". Torres made his last appearance of the season scoring twice in a 4–1 victory over Benfica in the Europa League on 8 April 2010, and it was announced on 18 April that he would miss the rest of the season to undergo knee surgery. This meant that Torres finished the season with 22 goals in 32 games in all competitions, finishing as Liverpool's top scorer for the second time. Following Roy Hodgson's appointment as Liverpool manager, Hodgson stated that Torres would not be sold by the club, saying, "He is not for sale and we don't welcome any offers for him. We want to keep him." Hodgson dismissed reports Torres was set to leave Liverpool by saying, "He has told us that he is looking forward to Monday, to getting back to work and looking forward to playing for Liverpool next season. That is what I know so other reports, I would suggest, are erroneous." Torres stated his commitment to Liverpool on 3 August: "My commitment and loyalty to the club and to the fans is the same as it was on my first day when I signed." Torres made his first appearance of the 2010–11 season in the opening match, a 1–1 draw with Arsenal on 14 August 2010, entering the game as a substitute in the 74th minute. He scored his first goal of the season with the winner in a 1–0 victory over West Brom on 29 August 2010, his 50th goal at Anfield in all competitions. Torres scored the winning goal in a 2–1 victory at home to Blackburn Rovers on 24 October 2010, his first goal since August. He scored his final goals for Liverpool in a 3–0 win away at Wolverhampton Wanderers on 22 January 2011. Torres got the 2011–12 season underway in Chelsea's 0–0 draw away against Stoke City on 14 August 2011, in which his "link-up play was sharp, plus he was willing to make intelligent runs into space to receive the ball". He scored his second goal at Chelsea, and his first of the season, on 18 September 2011, during an away game against Manchester United, the side's only goal in a 3–1 defeat. He scored his second goal of the season at home to Swansea City in a 4–1 victory. Ten minutes after his goal, however, a two-footed challenge on Mark Gower resulted in his first red card in English football and a three-match domestic suspension. On 19 October 2011, Torres scored two goals in a 5–0 victory against Genk in the Champions League, his first in Europe since the quarter-final of the 2008–09 Champions League with his old club Liverpool, against Chelsea. His next Chelsea goals came after scoring twice and also assisting two others against Championship team Leicester City in an FA Cup quarter-final on 18 March 2012, ending a goal drought that stretched 24 games. On 31 March 2012, Torres scored his first Premier League goal since 24 September 2011, against Aston Villa in a 4–2 away win. Torres came on as a substitute for Didier Drogba on 24 April 2012 to score a last-minute goal against Barcelona in the Champions League semi-final, which gave Chelsea a 2–2 draw, and also eliminated Barcelona from the tournament, as Chelsea won 3–2 on aggregate. He scored the first hat-trick of his Chelsea career in a 6–1 win against Queens Park Rangers at Stamford Bridge on 29 April 2012. Torres came on in the second half of the 2012 UEFA Champions League Final on 19 May 2012, directly after Bayern Munich's opening goal, and following a 1–1 draw after extra time Chelsea won the penalty shoot-out 4–3. His first full season at Chelsea finished with 11 goals in 49 appearances. Torres ended a goal drought that stretched over 11 hours of game time with two goals in Chelsea's 6–1 defeat of Nordsjælland in the Champions League on 5 December 2012. Three days later, he scored another two goals, ending a run of eight Premier League games without a goal, as Chelsea defeated Sunderland 3–1. He then scored in Chelsea's 2012 FIFA Club World Cup semi-final 3–1 win against Monterrey of the Mexican Liga MX on 13 December 2012, before playing in the 1–0 defeat to Brazilian Série A side Corinthians in the final three days later. On 14 March 2013, Torres scored the third goal as Chelsea defeated Steaua București 3–1 to advance 3–2 on aggregate to the quarter-final of the Europa League. With this goal, Torres became the first player to score in seven different competitions in one season. In April 2013, Torres acknowledged his struggles at Chelsea, saying, "I want to do the things I used to do. I did them at Atlético, I did them at Liverpool, but I am not doing them at Chelsea," but he vowed to "try his heart out" to regain his best form. He scored twice against Rubin Kazan in the 3–1 win in the first leg of the Europa League quarter-final on 4 April 2013, before scoring again in the second leg 3–2 defeat, with Chelsea progressing to the semi-final 5–4 on aggregate. Torres scored the opening goal in Chelsea's 2–1 triumph over Benfica in the 2013 UEFA Europa League Final on 15 May 2013. During the final match of the season, a 2–1 home win over Everton, he scored his first league goal of 2013, and finished the season with 22 goals in 64 matches. Torres was selected to start by Chelsea's new manager José Mourinho against Hull City on the opening day of the 2013–14 season, where he won a fifth-minute penalty kick. He scored his first goal of the season in the 2013 UEFA Super Cup against Bayern Munich. On 28 September 2013, he was sent off after receiving two yellow cards in Chelsea's 1–1 Premier League draw with Tottenham Hotspur at White Hart Lane. Torres joined Italian Serie A club Milan on a two-year loan on 31 August 2014. On his arrival, he expressed a desire to emulate some of the club's greatest strikers, stating he wanted, "My shirt to rank alongside [Marco] van Basten, [George] Weah and [Filippo] Inzaghi." He debuted on 20 September 2014, replacing Andrea Poli for the last 14 minutes of a 1–0 home defeat against Juventus and scored his first Milan goal with a looping header in their 2–2 draw with Empoli two days later. On 27 December 2014, it was announced that Torres' move to Milan would be made permanent on 5 January 2015, but two days later, he agreed to rejoin La Liga club Atlético Madrid on loan until the end of the 2015–16 season. The loan was agreed after Alessio Cerci went the opposite way from Atlético to Milan on the same day, 5 January. Torres' unveiling at the Vicente Calderón Stadium on 4 January 2015 drew a crowd of 45,000 persons. He played the first match of his second spell on 7 January 2015, starting in the first leg of a Copa del Rey last 16 tie against Real Madrid. He had no shots on target and was replaced by Koke after 59 minutes, but Atlético won 2–0. Eight days later in the second leg, he scored two goals – in the first minute of each half – as Atlético advanced, his first goals in an away Madrid derby. Torres scored in the first minute again in the quarter-finals, albeit in a 2–3 home defeat against Barcelona. On 17 March, Torres scored the winning kick in Atlético's 3–2 penalty shoot-out defeat of Bayer Leverkusen in the second leg of the teams' Champions League round of 16 tie. On 21 March, he scored his first La Liga goal since his return in the third minute of a 2–0 win against Getafe. After the departure of striker Mario Mandžukić, Torres changed his shirt number from 19 back to his usual 9, which he wore during the remainder of the 2015–16 season. On 6 February 2016, Torres scored his 100th goal with Atlético Madrid in a 3–1 home league victory against Eibar on his 295th appearance for the club. The following month, he marked the occasion of his 300th appearance for Atlético by scoring in a 3–1 victory over Valencia. On 5 April 2016, Torres scored the opening goal of Atlético's UEFA Champions League quarter-final with Barcelona at Camp Nou, before being sent off ten minutes later in an eventual 2–1 loss. On 5 July 2016, Torres signed for Atlético permanently on a one-year contract. In February 2017, he scored his 100th league goal in Spanish football when he netted a brace against Leganés. On 4 July 2017, Torres signed a new one-year contract with the rojiblancos to stay with his boyhood club for one more year after they were banned from signing new players. Torres came on as a 90th-minute substitute on 16 May 2018 as Atlético beat Marseille 3–0 at Parc Olympique Lyonnais in the 2018 UEFA Europa League Final. He scored two goals in his last match with Atlético in a 2–2 draw versus Eibar in the final week of championship. Torres signed for J1 League club Sagan Tosu on 10 July 2018. He scored his first goal for the club on 22 August in the Emperor's Cup, netting in a fourth round victory over Vissel Kobe. His first league goal followed five days later when he scored once and assisted a further two in a 3–0 win over Gamba Osaka. In February 2001, Torres won the Algarve Tournament with the Spain national under-16 team. The under-16s took part in the 2001 UEFA European Under-16 Championship in May, which they also won, with Torres scoring the only goal in the final, as well as finishing as the tournament's leading scorer, and was also named the player of the tournament. In September 2001, Torres represented the under-17 team at the 2001 FIFA U-17 World Championship, but the team failed to progress through the group stage. In July 2002, he won the 2002 UEFA European Under-19 Championship with the under-19 team and was again the only goalscorer in the final. Also, he finished as top scorer and was named player of the tournament. Torres scored 7 goals in 11 appearances in qualifying for the 2006 FIFA World Cup, making him Spain's top scorer for qualification, including a vital two goals against Belgium and his first international hat-trick against San Marino. At his first ever appearance in a FIFA World Cup finals at the 2006 World Cup in Germany, Torres scored the final goal in a 4–0 victory over Ukraine with a volley. In the second group match, Torres scored twice against Tunisia, first in the 76th minute to take Spain 2–1 into the lead, and then again from a penalty kick in the 90th. With three goals, he finished the tournament as Spain's top scorer alongside fellow striker David Villa. Torres was called up for Spain's Euro 2008 squad, where he set up Villa to score Spain's first goal of the tournament in the first game in the group stage against Russia. Torres came under criticism for apparently refusing to shake the hand of Spanish manager Luis Aragonés after being substituted off. He subsequently denied being angry with the coaching, saying that he was actually "irritated with himself". He scored his first goal of the tournament in Spain's next game, a 2–1 win over Sweden. Torres scored the winner and was named the man of the match in the final against Germany in a 1–0 victory. He said, "It's just a dream come true. This is my first title and I hope it's the first of many. Victory in a Euro, it is almost as big as a World Cup. We are used to watching finals on television, but today we were here and we won. My job is to score goals. I want to win more titles and be the most important player in Europe and the world." He was later named as a striker along with his striking partner David Villa in the Team of the Tournament. Torres made his 60th appearance for Spain in a 2010 World Cup qualification victory over Turkey on 28 March 2009, becoming the youngest player to reach this milestone. Torres was named in Spain's team for the 2009 FIFA Confederations Cup in June. He scored his second hat-trick for Spain after 17 minutes into a Confederations Cup match against New Zealand on 14 June, thus recording the fastest hat-trick by a player for Spain. He played for Spain as they were defeated 2–0 by the United States in the semi-final, as well as the third-place play-off, which Spain won 3–2 against South Africa after extra time. Having undergone knee surgery on 18 April 2010, and missing the end of the Premier League season, Torres' rehabilitation and fitness was closely monitored by Spain manager Vicente del Bosque. Although still out injured, Torres was selected for Spain's 2010 FIFA World Cup squad in May. On 8 June, Torres made his first appearance on the field in exactly two months, coming on as a substitute on 66 minutes against Poland in a pre-World Cup friendly. Torres came on as a substitute on 61 minutes in Spain's opening World Cup match on 16 June, a 1–0 defeat to Switzerland. He started the next two matches against Honduras and Chile and although his performances in the group stage were described as below-par, he received backing from Del Bosque. Torres came on as a substitute on 105 minutes in the final as Spain won the World Cup for the first time following a 1–0 victory over the Netherlands on 11 July 2010. Torres was selected in Del Bosque's Euro 2012 squad. In his first start of the tournament, he netted two goals as Spain defeated the Republic of Ireland 4–0 to eliminate them from the tournament. In the tournament final, Torres came on as a substitute against Italy, scoring one goal and assisting another, as Spain won a second consecutive European Championship with a 4–0 victory. This secured him the Golden Boot for the tournament with three goals and one assist, having played fewer minutes than Mario Gómez, who also had three goals and one assist. Torres won his 100th cap against Saudi Arabia on 7 September 2012, making him the sixth-highest capped player for Spain, and started the game as captain in goalkeeper Iker Casillas' absence. He became the first person in history to score four goals in one game in a FIFA Confederations Cup match during a 10–0 win over Tahiti on 20 June 2013 in the 2013 Confederations Cup. Torres also became the first player to score two hat-tricks in the Confederations Cup, and with five goals and one assist won the tournament's Golden Shoe, ahead of Fred having played fewer minutes. Torres has been described as having "an eye for the spectacular" and being "capable of world-class skill", as well as being regarded as a "technically proficient, highly successful striker". He has the ability to find himself in goalscoring positions, using his pace and vision to get in behind defenders. A hard-working striker, he is also known for his willingness to chase down and put pressure on opposing defenders, and is capable of playing off his teammates and creating chances for other strikers, in addition to scoring goals himself; this has also seen him be deployed in a deeper role as a second striker on occasion. Being strong in the air, and an accurate finisher with his head as well as both feet, in his prime, his prolific goalscoring earned him a reputation as one of the top strikers in the world. However, several injuries led to a loss of form, pace, confidence and a decreased goalscoring rate in more recent seasons. Torres' parents are José Torres and Flori Sanz. He has two older siblings: Israel (born 1977) and María Paz (born 1976). He married Olalla Domínguez Liste on 27 May 2009 in a private ceremony with just two witnesses at the local town hall in El Escorial, Madrid. They had been a couple since 2001 and are thought to have met in the Galician seaside town of Estorde, Cee, where Torres would go on family holidays each year to escape the Spanish capital. The couple have two children, a daughter, Nora, born on 8 July 2009 at the Hospital La Rosaleda, in Santiago de Compostela, Galicia, and a son, Leo, born on 6 December 2010 at Liverpool Women's Hospital, with Torres missing the fixture against Aston Villa at Anfield. HISTORIA DEL FÚTBOL ESPAÑOL, SELECCIONES ESPAÑOLAS (in Spanish). ISBN 978-84-8229-123-9. ^ "FIFA World Cup South Africa 2010: List of players: Spain" (PDF). FIFA. 4 June 2010. p. 29. Retrieved 3 September 2018. ^ "Fernando Torres". Barry Hugman's Footballers. Retrieved 10 July 2018. ^ "Fernando Torres". Chelsea F.C. Archived from the original on 22 August 2014. Retrieved 5 August 2014. ^ "Fernando Torres condecorado con la Medalla 'Ciudad de Fuenlabrada'" (in Spanish). SER Madrid Sur. 6 February 2009. Retrieved 13 March 2010. ^ a b c "Infancia" (in Spanish). Fernando Torres. Retrieved 20 June 2010. ^ "Torres asegura que habría sido "un gran portero"". Marca (in Spanish). Madrid. 17 April 2008. Retrieved 18 May 2011. ^ "Japanese comic superhero drawn to Tokyo Olympic bid". Agence France-Presse. 11 August 2009. Archived from the original on 17 September 2012. Retrieved 20 June 2010 – via TheFreeLibrary.com. ^ a b c d e f "Atlético de Madrid" (in Spanish). Fernando Torres. Retrieved 17 November 2008. ^ a b c d e Lowe, Sid (4 July 2007). "Will Torres be Kop's new God or just another Fernando?". The Guardian. London. Retrieved 5 August 2014. ^ a b c d e "Primer equipo" (in Spanish). Fernando Torres. Retrieved 17 November 2008. ^ a b c d e f g h i j k l m "Torres". FootballDatabase. Archived from the original on 15 February 2009. Retrieved 8 June 2008. ^ "Chelsea sign Bridge". The Daily Telegraph. London. 21 July 2003. Retrieved 30 January 2013. ^ "Statistics: top scorers: 2003/2004". ESPN FC. Retrieved 5 August 2014. ^ a b c "UEFA Intertoto Cup 2004". Rec.Sport.Soccer Statistics Foundation. Retrieved 9 June 2008. ^ "Atletico warn Chelsea off Torres". BBC Sport. 28 June 2005. Retrieved 18 May 2011. ^ "Atletico prepared to sell Torres". BBC Sport. 24 January 2006. Retrieved 18 May 2011. ^ "Newcastle want me, claims Torres". BBC Sport. 16 March 2006. Retrieved 27 July 2011. ^ Adams, Tom (6 February 2007). "'Flattered' Villa to stay with Che". Sky Sports. Retrieved 5 August 2014. ^ Prentice, David (20 June 2007). "Torres is Reds' number one target". Liverpool Echo. Archived from the original on 3 June 2013. Retrieved 30 June 2007. ^ "No Reds offer for Torres". The Daily Star. Dhaka. 27 June 2007. Archived from the original on 24 October 2012. Retrieved 20 June 2010. ^ Kay, Oliver (28 June 2007). "Garcia the key as Liverpool step up pursuit of Torres". The Times. London. Archived from the original on 18 September 2011. ^ a b "Liverpool complete Torres signing". BBC Sport. 4 July 2007. Retrieved 18 May 2011. ^ Carrick, Charles (30 June 2007). "Torres' £27m Liverpool deal". The Daily Telegraph. London. Retrieved 18 May 2011. ^ a b "Liverpool wrap up record Torres transfer". The Guardian. London. 4 July 2007. Retrieved 5 August 2014. ^ Balague, Guillem (31 March 2008). "Rafael Benitez opens up on transfers, treachery, Torres, titles – and, of course, tinkering". The Times. London. Archived from the original on 16 May 2008. ^ Sinnott, John (11 August 2007). "Aston Villa 1–2 Liverpool". BBC Sport. Retrieved 18 May 2011. ^ Sanghera, Mandeep (15 August 2007). "Toulouse 0–1 Liverpool". BBC Sport. Retrieved 18 May 2011. ^ Chowdhury, Saj (19 August 2007). "Liverpool 1–1 Chelsea". BBC Sport. Retrieved 18 May 2011. ^ McKenzie, Andrew (25 September 2007). "Reading 2–4 Liverpool". BBC Sport. Retrieved 18 May 2011. ^ Sinnott, John (28 November 2011). "Liverpool 4–1 FC Porto". BBC Sport. Retrieved 18 May 2011. ^ "Moyes & Torres win monthly awards". BBC Sport. 7 March 2008. Retrieved 18 May 2011. ^ a b c d e "Games played by Fernando Torres in 2007/2008". Soccerbase. Centurycomm. Retrieved 18 June 2012. ^ Barrett, Tony (6 March 2008). "Fernando Torres: My pride at Anfield hat-trick record". Liverpool Echo. Retrieved 5 August 2014. ^ May, John (15 March 2008). "Liverpool 2–1 Reading". BBC Sport. Retrieved 18 May 2011. ^ McKenzie, Andrew (8 April 2008). "Liverpool 4–2 Arsenal (agg 5–3)". BBC Sport. Retrieved 18 May 2011. ^ "Goalscorers for the 2001–2002 season". LFCHistory.net. Retrieved 18 May 2011. ^ "Ronaldo tops PFA nominations list". BBC Sport. 11 April 2008. Retrieved 18 May 2011. ^ a b "Ronaldo named player of the year". BBC Sport. 27 April 2008. Retrieved 18 May 2011. ^ "Ronaldo wins writers' award again". BBC Sport. 2 May 2008. Retrieved 18 May 2011. ^ "Torres equals Hunt record". Football.co.uk. 5 May 2008. Archived from the original on 10 August 2014. Retrieved 5 August 2014. ^ Caroe, Charlie (6 May 2008). "Jose Reina: Fernando Torres will improve". The Daily Telegraph. London. Retrieved 18 May 2011. ^ "Statistics: top scorers: 2007/2008". ESPN FC. Retrieved 5 August 2014. ^ Caroe, Charlie (26 May 2008). "Chelsea target Liverpool's Spanish striker Fernando Torres with £50 million bid". The Daily Telegraph. London. Retrieved 18 May 2011. ^ "Torres pledges long-term future to Reds". ESPN FC. 31 May 2008. Retrieved 5 August 2014. ^ "Hicks laughs off Torres sale talk". BBC Sport. 17 June 2008. Retrieved 27 May 2011. ^ Stevenson, Jonathan (16 August 2008). "Sunderland 0–1 Liverpool". BBC Sport. Retrieved 18 May 2011. ^ Eaton, Paul (1 September 2008). "Reds confirm Torres injury". Liverpool F.C. Archived from the original on 3 April 2015. ^ Sanghera, Mandeep (16 September 2008). "Marseille 1–2 Liverpool". BBC Sport. Retrieved 18 May 2011. ^ McNulty, Phil (27 September 2008). "Everton 0–2 Liverpool". BBC Sport. Retrieved 18 May 2011. ^ Sanghera, Mandeep (5 October 2008). "Man City 2–3 Liverpool". BBC Sport. Retrieved 18 May 2011. ^ Custis, Neil (5 October 2008). "Man City 2 Liverpool 3". The Sun. London. Archived from the original on 26 May 2012. ^ "Torres ruled out for '10–15 days'". BBC Sport. 16 October 2008. Retrieved 27 July 2011. ^ McNulty, Phil (22 October 2008). "Atletico Madrid 1–1 Liverpool". BBC Sport. Retrieved 18 May 2011. ^ Ogden, Mark (21 October 2008). "Fernando Torres puts Chelsea-Liverpool clash ahead of Atletico Madrid return". The Daily Telegraph. London. Retrieved 21 January 2011. ^ "Ronaldo voted FIFPro World Player of the Year". UEFA. 27 October 2008. Retrieved 18 May 2011. ^ Hughes, Ian (8 November 2008). "Liverpool 3–0 West Brom". BBC Sport. Retrieved 18 May 2011. ^ "Torres open to Atletico return". Sky Sports. 9 November 2008. Retrieved 5 August 2014. ^ "Striker Torres faces new lay-off". BBC Sport. 27 November 2008. Retrieved 27 July 2011. ^ "Liverpool hit by Torres setback". BBC Sport. 4 December 2008. Retrieved 27 July 2011. ^ "Ronaldo, Torres up for Fifa award". BBC Sport. 12 December 2008. Retrieved 18 May 2011. ^ "Ronaldo collects Fifa world title". BBC Sport. 12 January 2009. Retrieved 12 January 2009. ^ Ashenden, Mark (3 January 2009). "Preston 0–2 Liverpool". BBC Sport. Retrieved 18 May 2011. ^ McNulty, Phil (1 February 2009). "Liverpool 2–0 Chelsea". BBC Sport. Retrieved 1 February 2009. ^ McNulty, Phil (10 March 2009). "Liverpool 4–0 Real Madrid (agg 5–0)". BBC Sport. Retrieved 18 May 2011. ^ McNulty, Phil (14 March 2009). "Man Utd 1–4 Liverpool". BBC Sport. Retrieved 18 May 2011. ^ "Harry Wilson copies Fernando Torres' 'five times' Liverpool celebration after scoring at Manchester United". Hull Daily Mail. Retrieved 10 October 2018. ^ "Giggs earns prestigious PFA award". BBC Sport. 26 April 2009. Retrieved 18 May 2011. ^ Brett, Oliver (24 May 2009). "Liverpool 3–1 Tottenham". BBC Sport. Retrieved 25 May 2009. ^ "Torres agrees new Liverpool deal". BBC Sport. 28 May 2009. Retrieved 27 July 2011. ^ "Torres signs new Liverpool deal". BBC Sport. 14 August 2009. Retrieved 27 July 2011. ^ "Torres signs contract extension with Liverpool". ESPN FC. 14 August 2009. Retrieved 5 August 2014. ^ Ashenden, Mark (19 September 2009). "West Ham 2–3 Liverpool". BBC Sport. Retrieved 18 May 2011. ^ Hunter, Andy (28 September 2009). "Priceless Fernando Torres slays Hull with a hat-trick show fit for a prince". The Guardian. London. Retrieved 5 August 2014. ^ "Torres and Ferguson scoop awards". BBC Sport. 2 October 2009. Retrieved 18 May 2011. ^ McNulty, Phil (25 October 2009). "Liverpool 2–0 Man Utd". BBC Sport. Retrieved 18 May 2011. ^ "Benitez hails quality of Torres". BBC Sport. 26 October 2009. Retrieved 27 July 2011. ^ Leach, Jimmy (22 December 2009). "FIFA/FIFPRO World XI announced". The Independent. London. Retrieved 31 August 2014. ^ Ornstein, David (29 December 2009). "Aston Villa 0–1 Liverpool". BBC Sport. Retrieved 18 May 2011. ^ "Rafa Benitez defends his decision to take off Torres". BBC Sport. 4 April 2010. Retrieved 27 July 2011. ^ a b c "Games played by Fernando Torres in 2009/2010". Soccerbase. Centurycomm. Retrieved 18 June 2012. ^ a b "Liverpool's Fernando Torres out for rest of season". BBC Sport. 18 April 2010. Retrieved 27 July 2011. ^ "Gerrard and Torres staying at Liverpool – Hodgson". BBC Sport. 16 July 2010. Retrieved 27 July 2011. ^ "Hodgson expects Fernando Torres to stay at Liverpool". BBC Sport. 27 July 2010. Retrieved 27 July 2011. ^ "Striker Fernando Torres committed to Liverpool". BBC Sport. 3 August 2010. Retrieved 27 July 2011. ^ Sanghera, Mandeep (15 August 2010). "Liverpool 1–1 Arsenal". BBC Sport. Retrieved 18 May 2011. ^ Sanghera, Mandeep (29 August 2010). "Liverpool 1–0 West Brom". BBC Sport. Retrieved 18 May 2011. ^ "Torres landmark nets WBA win". Liverpool F.C. 29 August 2010. Archived from the original on 27 December 2014. ^ Magowan, Alistair (24 October 2010). "Liverpool 2–1 Blackburn". BBC Sport. Retrieved 18 May 2011. ^ Sanghera, Mandeep (22 January 2011). "Wolverhampton 0–3 Liverpool". BBC Sport. Retrieved 18 September 2011. ^ Smith, Rory (27 January 2011). "Chelsea's £40 million bid for Liverpool striker Fernando Torres is an act of desperation". The Daily Telegraph. London. Retrieved 6 February 2011. ^ Mondal, Subhankar (29 January 2011). "Quotes of the Week: 'Fernando Torres Tonight Submitted A Transfer Request', Wolfsburg Offer Volkswagens For Schulz And Adriano Galliani Is The New Moggi & More". Goal.com. Retrieved 6 February 2011. ^ "Torres makes record move from Liverpool to Chelsea". BBC Sport. 31 January 2011. Retrieved 27 July 2011. ^ McNulty, Phil (6 February 2011). "Chelsea 0–1 Liverpool". BBC Sport. Retrieved 18 May 2011. ^ McNulty, Phil (23 April 2011). "Chelsea 3–0 West Ham". BBC Sport. Retrieved 24 April 2011. ^ a b c "Games played by Fernando Torres in 2010/2011". Soccerbase. Centurycomm. Retrieved 18 June 2012. ^ Magowan, Alistair (14 August 2011). "Stoke 0–0 Chelsea". BBC Sport. Retrieved 24 June 2017. ^ McNulty, Phil (18 September 2011). "Manchester United 3–1 Chelsea". BBC Sport. Retrieved 24 June 2017. ^ Williams, Aled (24 September 2011). "Chelsea 4–1 Swansea". BBC Sport. Retrieved 25 September 2011. ^ Lemesre, Pascal (24 September 2011). "Fernando Torres handed red card after scoring". Sportsmole. Retrieved 24 September 2011. ^ "Fernando Torres: Chelsea start has been 'very, very difficult'". The Guardian. London. 26 September 2011. Archived from the original on 6 December 2011. Retrieved 12 April 2013. ^ Shemilt, Stephan (19 October 2011). "Chelsea 5–0 Genk". BBC Sport. Retrieved 24 June 2017. ^ Chase, Graham (18 March 2012). "Chelsea 5–2 Leicester". BBC Sport. Retrieved 24 June 2017. ^ a b c "Games played by Fernando Torres in 2011/2012". Soccerbase. Centurycomm. Retrieved 18 June 2012. ^ Dawkes, Phil (24 April 2012). "Barcelona 2–2 Chelsea (agg 2–3)". BBC Sport. Retrieved 24 April 2012. ^ Higginson, Marc (29 April 2012). "Chelsea 6–1 QPR". BBC Sport. Retrieved 29 April 2012. ^ McNulty, Phil (19 May 2012). "Bayern Munich 1–1 Chelsea". BBC Sport. Retrieved 23 August 2012. ^ Smith, Ben (12 August 2012). "Chelsea 2–3 Man City". BBC Sport. Retrieved 23 August 2012. ^ Scrivener, Peter (19 August 2012). "Wigan 0–2 Chelsea". BBC Sport. Retrieved 23 August 2012. ^ Sanghera, Mandeep (22 August 2012). "Chelsea 4–2 Reading". BBC Sport. Retrieved 23 August 2012. ^ a b c d e f g "Games played by Fernando Torres in 2012/2013". Soccerbase. Centurycomm. Retrieved 4 May 2018. ^ "English Premier League 2012–2013 : Table". Statto Organisation. Archived from the original on 29 October 2012. Retrieved 11 April 2013. ^ McNulty, Phil (28 October 2012). "Chelsea 2–3 Man Utd". BBC Sport. Retrieved 6 November 2012. ^ "Chelsea 3–2 Shakhtar Donetsk". ESPN FC. 7 November 2012. Archived from the original on 26 February 2014. Retrieved 8 November 2012. ^ Field, Dominic (21 November 2012). "Rafael Benítez appointed Chelsea interim manager until end of season". The Guardian. London. Retrieved 5 August 2014. ^ Croydon, Emily (22 November 2012). "Can Rafael Benitez bring back the old Fernando Torres at Chelsea?". BBC Sport. Retrieved 15 March 2013. ^ Palmer, Kevin (7 December 2012). "Torres: I need more time to perform". ESPN FC. Retrieved 5 August 2014. ^ "Fernando Torres nets brace as Chelsea see off Sunderland in Premier League". Sky Sports. 8 December 2012. Retrieved 13 November 2015. ^ Peterson, Brad (3 March 2017). "30 truly random football facts". GiveMeSport. Retrieved 16 November 2017. ^ a b "Goal total clarification". Chelsea F.C. 25 May 2013. Archived from the original on 23 July 2013. ^ "Chelsea 2–0 Hull City". The Guardian. London. 18 August 2013. Retrieved 24 October 2013. ^ a b "Games played by Fernando Torres in 2013/2014". Soccerbase. Centurycomm. Retrieved 2 December 2015. ^ "Chelsea and John Terry draw at Tottenham Hotspur but Torres sees red". The Guardian. London. 29 September 2013. Retrieved 24 October 2013. ^ "Schalke fall to clinical Chelsea". UEFA. 22 October 2013. Retrieved 22 October 2013. ^ "Champions League 2013/14: Fernando Torres hits brace in Chelsea victory over Schalke". The Sydney Morning Herald. 22 October 2013. Retrieved 13 November 2015. ^ Winter, Henry (27 October 2013). "Chelsea 2 Manchester City 1: match report". The Daily Telegraph. London. Retrieved 27 October 2013. ^ "Fernando Torres: AC Milan seal loan deal for Chelsea striker". BBC Sport. 31 August 2014. Retrieved 31 August 2014. ^ "Milan 0–1 Juventus". BBC Sport. 20 September 2014. Retrieved 21 September 2014. ^ "Empoli 2–2 Milan". BBC Sport. 23 September 2014. Retrieved 4 January 2015. ^ "AC Milan sign Chelsea's Fernando Torres on permanent deal". BBC Sport. 27 December 2014. Archived from the original on 28 December 2014. ^ "Fernando Torres: Atletico Madrid loan deal for AC Milan striker". BBC Sport. 29 December 2014. Retrieved 29 December 2014. ^ "Official: Cerci joins AC Milan on loan". A.C. Milan. 5 January 2015. Retrieved 5 January 2015. ^ "Fernando Torres: Atletico Madrid fans welcome striker on return". BBC Sport. 4 January 2015. Retrieved 4 January 2015. ^ "Atl Madrid 2–0 Real Madrid". BBC Sport. 7 January 2015. Retrieved 7 January 2015. ^ "Real Madrid 2–2 Atl Madrid". BBC Sport. 15 January 2015. Retrieved 15 January 2015. ^ Reddy, Luke (28 January 2015). "Atl Madrid 2–3 Barcelona". BBC Sport. Retrieved 28 January 2015. ^ "Atlético Madrid through after penalty pressure sinks Bayer Leverkusen". The Guardian. London. 18 March 2015. ^ "Atl Madrid 2–0 Getafe". BBC Sport. 21 March 2015. ^ Swaby, Sean (24 June 2015). "Fernando Torres Will Once Again Wear Atletico Madrid's Famed No. 9 Shirt". Bleacher Report. Turner. Retrieved 26 June 2015. ^ "Torres marca su gol 100 con el Atlético de Madrid" [Torres scores his 100th goal with Atlético Madrid]. Marca (in Spanish). Madrid. 6 February 2016. Retrieved 26 January 2018. ^ "Torres marks 300th Atleti appearance in style". Marca. Madrid. 6 March 2016. Retrieved 8 March 2016. ^ "Barcelona 2–1 Atlético". The Guardian. London. 5 April 2016. ^ "Torres signs one-year contract with Atletico Madrid". FourFourTwo. 4 July 2016. Retrieved 24 June 2017. ^ Corrigan, Dermot (4 February 2017). "Fernando Torres 'very happy' after scoring 100th league goal for Atletico". ESPN FC. Retrieved 28 February 2017. ^ "Fernando Torres signs new one-year Atletico Madrid contract". ESPN FC. 4 July 2017. Retrieved 12 July 2017. ^ a b Hafez, Shamoon (16 May 2018). "Marseille 0–3 Atlético Madrid". BBC Sport. Retrieved 23 October 2018. ^ "Club legend Torres bows out with two goals in final game for Atletico Madrid". The 42. 20 May 2018. Retrieved 21 May 2018. ^ "Fernando Torres: Ex-Liverpool and Chelsea striker signs for Japan's Sagan Tosu". BBC Sport. 10 July 2018. Retrieved 10 July 2018. ^ "第98回天皇杯　サガン鳥栖が3発快勝で準々決勝進出！　フェルナンド・トーレス選手、移籍後初ゴール" [98th Emperor's Cup Sagan Tosu won 3–0, Fernando Torres scored his first goal] (in Japanese). JFA. 23 August 2018. Retrieved 24 August 2018. ^ Smith, Jamie (22 August 2018). "Torres scores first Sagan Tosu goal in Iniesta reunion". Goal. Retrieved 5 September 2018. ^ Duerden, John (27 August 2018). "Fernando Torres scores one, sets up two as Sagan Tosu ease relegation worries". Kwese ESPN. Retrieved 5 September 2018. ^ "9. Fernando Torres". Liverpool Echo. Archived from the original on 13 October 2012. Retrieved 8 June 2008. ^ a b Smith, Andrew (6 June 2010). "Andrew Smith: David Villa lacks the ego of his contemporaries". The Scotsman. Edinburgh. Retrieved 19 March 2012. ^ "Fernando Torres". FIFA. Retrieved 13 November 2015. ^ "Spain 4–0 Ukraine". BBC Sport. 14 June 2006. Retrieved 18 May 2011. ^ "Spain – Tunisia". FIFA. Archived from the original on 17 October 2013. Retrieved 18 May 2011. ^ "Top goals". FIFA. Archived from the original on 13 December 2013. Retrieved 11 June 2008. ^ "Raul left out of Spain Euro squad". BBC Sport. 17 May 2008. Retrieved 18 May 2011. ^ Ronay, Barney (10 June 2008). "Quicksilver Villa lights up the Alps". The Guardian. London. Retrieved 5 August 2014. ^ a b Taylor, Daniel (14 June 2008). "Torres plays up respect for Aragones". The Guardian. London. Retrieved 5 August 2014. ^ Bevan, Chris (14 June 2008). "Sweden 1–2 Spain". BBC Sport. Retrieved 18 May 2011. ^ McNulty, Phil (29 June 2008). "Germany 0–1 Spain". BBC Sport. Retrieved 18 May 2011. ^ Rogers, Martin (29 June 2008). "Euro 2008: Man of the match, June 29". Yahoo! Sports. Archived from the original on 25 October 2012. Retrieved 18 May 2011. ^ "Spain view". BBC Sport. 30 June 2008. Retrieved 18 May 2011. ^ "Team of the Tournament" (PDF). UEFA. 30 June 2008. Retrieved 20 June 2010. ^ "España vence a una digna Turquía en el partido 60 de Torres con la Selección absoluta (1–0)" (in Spanish). Fernando Torres. 28 March 2009. Retrieved 31 March 2009. ^ "Spain unveils Confederations Cup roster". CBC Sports. 1 June 2009. Retrieved 5 August 2014. ^ Scrivener, Peter (14 June 2009). "Spain 5–0 New Zealand". BBC Sport. Retrieved 18 May 2011. ^ Mollina, R.; Campos, T. (14 June 2009). "Torres logra el 'hat trick' más rápido de la historia de la selección". Marca (in Spanish). Madrid. Retrieved 14 June 2009. ^ Chowdhury, Saj (25 June 2009). "Spain 0–2 United States". BBC Sport. Retrieved 18 May 2011. ^ "Spain 3–2 South Africa (aet)". BBC Sport. 28 June 2009. Retrieved 18 May 2011. ^ "Spain omit Marcos Senna from 2010 World Cup squad". BBC Sport. 20 May 2010. Retrieved 18 May 2011. ^ "World Cup 2010 – Torres helps Spain rout Poland". Yahoo! UK & Ireland Eurosport. 8 June 2010. Archived from the original on 13 November 2015. Retrieved 13 November 2015. ^ Sheringham, Sam (16 June 2010). "Spain 0–1 Switzerland". BBC Sport. Retrieved 18 May 2011. ^ "Del Bosque backs Torres". Sky Sports. 27 June 2010. Archived from the original on 22 October 2012. Retrieved 27 June 2010. ^ Fletcher, Paul (11 July 2010). "Netherlands 0–1 Spain". BBC Sport. Retrieved 18 May 2011. ^ "Euro 2012: Spain name Fernando Torres in 23-man squad". BBC Sport. 27 May 2012. Retrieved 11 April 2013. ^ Chase, Graham (14 June 2012). "Spain 4–0 R. of Ireland". BBC Sport. Retrieved 15 June 2012. ^ McNulty, Phil (1 July 2012). "Spain 4–0 Italy". BBC Sport. Retrieved 11 July 2012. ^ "Euro 2012: Spain striker Fernando Torres wins Golden Boot award". BBC Sport. 2 July 2012. Retrieved 11 July 2012. ^ "Spain make light work of Saudi Arabia". FIFA. 7 September 2012. Archived from the original on 9 July 2014. ^ "Spain 10–0 Tahiti". Yahoo! UK & Ireland Eurosport. 20 June 2013. Archived from the original on 17 November 2015. Retrieved 20 August 2013. ^ Rodgers, Zach (20 June 2013). "Spain tallies 10 in historic win; Forlán secures Uruguay victory". ESPN FC. Retrieved 5 August 2014. ^ Peck, Brooks (1 July 2013). "Fernando Torres wins another Golden Boot award, is understandably less than excited about it". Yahoo! Sports. Retrieved 2 August 2014. ^ "Spain 2–0 Bolivia". BBC Sport. 30 May 2014. Retrieved 24 June 2017. ^ "World Cup 2014: Spain drop Alvaro Negredo and Jesus Navas". BBC Sport. 31 May 2014. Retrieved 24 June 2017. ^ Ornstein, David (13 June 2014). "Spain 1–5 Netherlands". BBC Sport. Retrieved 24 June 2017. ^ Ornstein, David (18 June 2014). "Spain 0–2 Chile". BBC Sport. Retrieved 24 June 2017. ^ a b Chowdhury, Saj (23 June 2014). "Australia 0–3 Spain". BBC Sport. Retrieved 24 June 2017. ^ "Profile". ESPN FC. Archived from the original on 4 January 2014. ^ Wyman, Ed (6 December 2010). "The 25 Best Premier League Speedsters: Ashley Cole, Fernando Torres, Gareth Bale and More: Fernando Torres". Bleacher Report. Turner. Retrieved 13 November 2015. ^ Welch, Ben. "Torres on the art of striking". FourFourTwo. Retrieved 24 June 2017. ^ RICHARD JOLLY (8 December 2012). "Torres on evolutionary path". ESPN FC. Retrieved 17 March 2017. ^ Lowe, Sid (14 April 2015). "Atlético's Fernando Torres happy with cameo role as Real Madrid clash beckons". The Guardian. Retrieved 17 March 2017. ^ "Torres sogna l'Italia: Inter, Juve e Milan alla finestra" (in Italian). Sky.it. 17 April 2009. Retrieved 16 March 2017. ^ Wilson, Steve (1 October 2009). "Torres, Drogba or Rooney – who's the best?". BBC Sport. Retrieved 16 March 2017. ^ Fraser, Peter (28 December 2013). "What went wrong?". Sky Sports. Retrieved 16 March 2017. ^ McNulty, Phil (16 September 2011). "Can £50m Striker Torres Recapture His Golden Form?". BBC Sport. Retrieved 16 March 2017. ^ Roden, Lee (6 February 2015). "Should Torres or Mandzukic complete Simeone's Atletico strike duo?". ESPN FC. Retrieved 17 March 2017. ^ "Football is a funny ol game". The Sun. London. 15 April 2008. Archived from the original on 13 July 2014. ^ Galaz, Mábel (28 May 2009). "Se casa Fernando Torres". El País (in Spanish). Madrid. Retrieved 19 March 2012. ^ "Liverpool star Fernando Torres becomes a dad". Daily Mirror. London. 10 July 2009. Archived from the original on 13 May 2013. Retrieved 18 May 2011. ^ "Fernando Torres welcomes baby Leo as Liverpool striker's wife Olalla gives birth". football.co.uk. 7 December 2010. Retrieved 24 June 2017. ^ "Balls to the Crunch". FourFourTwo: 50. February 2009. ^ "Dani Martín" (in Spanish). Fernando Torres. 30 September 2005. Retrieved 20 June 2010. ^ "Torrente 3: El protector: Full Cast & Crew". IMDb. Retrieved 26 January 2018. ^ Wilson, Simon (22 October 2009). "El Nino: My Story". ESPN FC. Retrieved 13 November 2015. ^ "Famous Tolkien and Lord of the Ring fans". Tolkien Library. Retrieved 4 July 2013. ^ "Fernando Torres: Fernando José Torres Sanz: Matches: 2000–01". BDFutbol. Retrieved 4 May 2018. ^ "Fernando Torres: Fernando José Torres Sanz: Matches: 2001–02". BDFutbol. Retrieved 4 May 2018. ^ "Fernando Torres: Fernando José Torres Sanz: Matches: 2002–03". BDFutbol. Retrieved 4 May 2018. ^ "Fernando Torres: Fernando José Torres Sanz: Matches: 2003–04". BDFutbol. Retrieved 4 May 2018. ^ "Fernando Torres: Fernando José Torres Sanz: Matches: 2004–05". BDFutbol. Retrieved 4 May 2018. ^ "Fernando Torres: Fernando José Torres Sanz: Matches: 2005–06". BDFutbol. Retrieved 4 May 2018. ^ "Fernando Torres: Fernando José Torres Sanz: Matches: 2006–07". BDFutbol. Retrieved 4 May 2018. ^ "Games played by Fernando Torres in 2008/2009". Soccerbase. Centurycomm. Retrieved 18 June 2012. ^ "Games played by Fernando Torres in 2014/2015". Soccerbase. Centurycomm. Retrieved 2 December 2015. ^ a b c "F. Torres: Summary". Soccerway. Perform Group. Retrieved 15 April 2019. ^ "Fernando Torres: Fernando José Torres Sanz: Matches: 2014–15". BDFutbol. Retrieved 4 May 2018. ^ "Fernando Torres: Fernando José Torres Sanz: Matches: 2015–16". BDFutbol. Retrieved 4 May 2018. ^ "Fernando Torres: Fernando José Torres Sanz: Matches: 2016–17". BDFutbol. Retrieved 4 May 2018. ^ "Fernando Torres: Fernando José Torres Sanz: Matches: 2017–18". BDFutbol. Retrieved 10 July 2018. ^ "Torres, Fernando". National Football Teams. Benjamin Strack-Zimmerman. Retrieved 15 April 2019. ^ a b c d e f g h i j k l m "Palmarés" (in Spanish). Fernando Torres. Retrieved 17 November 2008. ^ "Spot-on Real Madrid defeat Atlético in final again". UEFA. Retrieved 18 May 2018. ^ "Torres seals Spanish triumph". UEFA. Retrieved 5 June 2016. ^ a b c "Fernando Torres". UEFA. 5 June 2013. Retrieved 5 June 2016. ^ "Torres sparkles for Spain". UEFA. Retrieved 5 June 2016. ^ "Tracking Fernando Torres' career since he left Atletico Madrid". Goal.com. 31 August 2012. Retrieved 5 June 2016. ^ "Fernando Torres: Overview". Premier League. Retrieved 28 September 2018. ^ "Goal of the month, April 2009". BBC Sport. 9 June 2009. Retrieved 17 October 2012. ^ "Hero Torres completes honours list". UEFA. 30 June 2008. Retrieved 8 June 2016. ^ "The players". FIFPro. Retrieved 5 June 2016. ^ "Special ESM Squads". European Football Statistics. Retrieved 5 June 2016. ^ "FIFA World Player of the Year – Women's votes by player" (PDF). FIFA. 12 January 2009. Retrieved 5 June 2016. ^ Pierrend, José Luis (16 January 2009). "European Footballer of the Year ("Ballon d'Or") 2008". Rec.Sport.Soccer Statistics Foundation. Retrieved 5 June 2016. ^ "FIFA Confederations Cup South Africa 2009 – Awards". FIFA. Retrieved 5 June 2016. ^ "Fernando Torres receives the MARCA Leyenda". Marca. Madrid. 6 February 2012. Retrieved 5 June 2016. ^ "FIFA Confederations Cup Brazil 2013 – Awards". FIFA. Retrieved 5 June 2016. ^ Bruña, Manel (10 May 2011). "Las campeones del mundo de fútbol ya tienen la Real Orden del Mérito Deportivo". El Mundo Deportivo (in Spanish). Barcelona. Retrieved 5 March 2013.